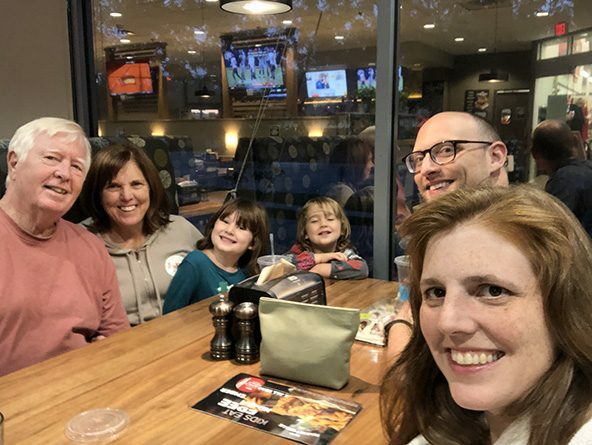 Above: Sen. Machaela Cavanaugh enjoying family time with husband Nick Brotzel, daughters Harriet and Della, and her parents Kate and John Cavanaugh. Somewhere in Omaha Sen. Machaela Cavanaugh’s home sits a neglected trunk. It was handed down by her mother and is filled with the relics of a previous life of “free time”—before having children and before deciding to run for the Nebraska Legislature. Cavanaugh has less time to indulge in embroidery, crocheting and knitting these days, but it’s a trade-off that she is happy to make. Cavanaugh comes from a family of public servants: a community college board member, county clerk, county commissioner, public service commissioner, postmaster general, state senator and congressman all are represented in the Cavanaugh family ranks. While a career in politics might have seemed inevitable, Cavanaugh was perfectly happy working in the nonprofit world. It was not until she pursued her master’s degree in public administration from the University of Nebraska at Omaha that she realized the impact she could have on a larger scale. She attributed part of that frustration to the makeup of the Legislature. She and husband Nick considered the idea of her running for a seat in the Legislature—and kept revisiting it over time—before finally deciding that she would challenge the incumbent state senator last year. “It was mostly that I didn’t feel like the people who needed a voice the most were being represented,” Cavanaugh said. It is her partnership with Nick that allows her to serve in Lincoln and keeps their three children—Della, Harriet and Barrett—in a happy routine. Cavanaugh drops the children off at child care each morning while Nick picks them up every evening. And, as with all other working parents, sometimes life or mother nature throws a curveball their way. A snowstorm earlier this session meant Barrett, who is still nursing, came to work with Mom, while Della and Harriet remained in Omaha with Dad. But most importantly, she said, her family was able to do what was best for them in that situation. Finding ways to support parents in the workplace has been a legislative priority for Cavanaugh. “It’s important for everyone to feel supported in the workplace, but it’s especially important for women who are coming back from giving birth … to feel like they can still contribute what they’ve always contributed,” she said.